Lazy irresponsibility, rather than blunt honesty. 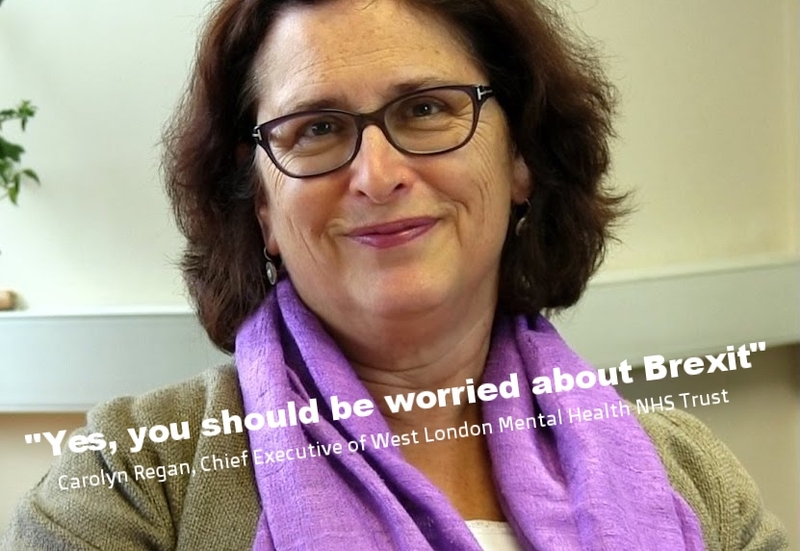 Carolyn Regan, the Chief Executive (CEO) of West London NHS Mental Health Trust (WLMHT) penned an article in The Guardian last month: ”As an NHS boss, there is little I can do to reassure EU staff about Brexit” (11 Sep 2017). It is yet another example of misdiagnosing a problem in the NHS and rushing to blame Brexit for it - except this time with very poor leadership thrown in too. I can only suggest an obvious alternative approach: if you are trying to reassure your EU staff, it is probably a good idea to avoid specifically telling them to be worried? In fact, I'd propose a number of alternative answers to the question “Should we be worried about Brexit?”: “Are you worried?”, “If so, what are you specifically worried about?, "How can I help?” and even just "maybe"? If someone is worried - lets say about reciprocal healthcare arrangements - you could advise them the EU/UK have already agreed this in principle as part of the Brexit negotiations. Not a guarantee until a finalised deal, but a positive step. The Trust has increased its EU staff from 308 to 318 between Sep 2016 and April 2017 (Source: NHS Digital). The Trust has exactly the same number of EU Doctors today as post-Brexit referendum, and only 1 less Nurse. And this is only the best data publicly available which covers up until April 2017 - according to Ms Regan’s article “Currently we have 332 staff from the EU” - if that is accurate then between April-17 and Sep-17 a further +14 net EU staff were added. This would suggest slight acceleration in EU numbers is now occurring compared to the post-Brexit period. WLMHT added +10 EU staff in the last 6 months of 2016, compared to +15 in the same period of 2015. Yes this is slightly slower growth, but hardly a crisis. WLMHT added more EU staff post referendum result than UK nationals! Over that same Sep-16 to April-17 period, WLMHT added +3 UK staff. That’s it. It lost 10 UK doctors, and 8 UK other staff. Nurses were slightly better, however, adding 22. UK nationals in the WLMHT workforce are about 7 times larger compared to EU nationals, so WLMHT UK nationals recruitment/retention is relatively far worse than EU staff. Not a good message overall for the Trust, but shows that just focusing on EU staff alone is the wrong approach. Virtue signalling about Brexit in The Guardian ignores WLMHT’s actual staff retention/recruitment problems. WLMHT has lost 4 Rest of World (RoW) doctors, and 10 UK doctors on a net basis since June 2016. It has lost zero EU doctors. Since Ms Regan has been Chief Executive (Dec 2015), WLMHT has lost 8 RoW doctors, 20 UK ones, and 4 from the EU. And EU doctors are still higher than in 2009/2010, while all other nationalities are lower. Needless to say, Ms. Regan hasn’t published an article in The Guardian outlining her plans to tackle these real problems in UK/RoW staffing - but has published one about a relative non-problem in EU staffing. Of course, only one of those meets the Pro-Remain prejudice of the newspaper, but this is wasting leadership time and potentially NHS resources by focusing on the wrong problems. The NHS carries out a survey of all staff on an annual basis, with hundreds of thousands taking part. In 2016 the survey was carried out between Sep 2016 and Dec 2016, so well after the referendum result (and the “wave of xenophobia” apparently unleashed, which I’ve written about elsewhere). The WLMHT 2016 staff survey shows improved scores for satisfaction with resourcing, as well as lower instances of harassment and abuse of staff (despite those xenophobia headlines). This is real opinions from Nurses, Doctors, Pharmacists, and other support staff working in WLMHT. Oh, really? I don’t think you are - since you didn’t even try to find out how many EU Nationals there were in WLMHT until 10 months after the vote! Yes, really: WLMHT didn’t even know how many EU Nationals worked for the trust until April 2017 (see WLMHT board minutes for April 2017: ”EU nationals – work had now concluded on establishing the numbers of EU staff employed by the Trust and where they were located”). This is an inexcusable 12 months after the start of the referendum campaign. Worse, Ms Regan and her management team didn’t even ask for this information until February 2017 (see WLMHT board minutes for March 2017, which shows that the action to produce this information was only started then). I’m only speculating, but it may be that what triggered WLMHT management to find out this key information about their workforce wasn’t the referendum, or even the result of the vote - but overblown articles in the media about EU staff "fleeing" the NHS, which started to be published around the same time. If this is true, it is inexcusably bad management - it shouldn't take newspaper articles to trigger you finding out basic information about your workforce. So, what would “doing everything we can” actually look like? Well, it would have included gathering workforce information on EU nationals in advance of the vote (just in case of a vote to Leave), with a pro-active communications plan in place to reassure those staff, along with forums for EU staff ask questions and raise concerns with Trust leadership. None of these things appear to have been done. That is just poor leadership and management, for which only WLMHT management should take the blame - not Brexit, not Health Secretary Jeremy Hunt, not “Tory cuts” or any of the other tropes that are trotted out to excuse any failure of highly paid people* as long as they are wearing an NHS lanyard around their neck. Well done Penny! But when your CEO is struggling to reassure hundreds of your staff (and they are apparently on the verge of leaving the Trust and the UK), maybe your internal communications team might want to re-prioritise? Okay, what does the CEO of WLMHT suggest is done to reassure EU staff instead? Yes, these are literally Ms Regan’s only suggestions for what will help persuade her EU staff to stay in the UK: likely paying for expensive London accommodation out of NHS budgets, and providing clairvoyance about their careers, decades into the future. It is ironic that Ms Regan recommends "strongly making the case for [EU Nationals] to stay" in a major national newspaper, then fails to make the case herself when given the opportunity. Why was this a big enough issue to write about in The Guardian, but not in WLMHT's annual report? West London Mental Health Trust's Annual Report was published in May 2017. Entire sections are written by Ms Regan and she is responsible for signing off the whole product. Not only does the annual report not even mention Brexit, it doesn’t even mention European Union staff at all. Any references to staffing or recruitment issues are correctly identified as location specific (e.g. struggled to attract Nurses to work at Jimmy Saville’d scandal-hit Broadmoor Hospital), or role specific (e.g. Nurses in general). “Little you can do to reassure?” How about setting out your views on EU staff in your own annual report covering the Brexit period rather than writing scaremongering articles in The Guardian? Of course, everyone can agree with the sentiment about healthcare staff working together and caring for patients with professionalism, no matter where they are from. But - I'm sorry Ms Regan, ‘National’ in "NHS" really doesn’t mean “all one service together” with “no borders”. It really doesn’t. It denotes the fact that the National Health Service is a health service for the nation of England. Clearly you should know this anyway being a CEO of an NHS Trust, but you can test this out by trying to get free prescriptions on either side of the "no borders" Scottish border and seeing if there is a difference in the “care” provided. Or by going to Wales. And if “borders” matter inside the UK itself, they surely matter outside of it. I don’t think it is too harsh to expect a highly paid CEO, leading a major NHS Trust, to be a good communicator, to have pro-actively prepared for one of two potential outcomes of the Brexit vote, and to readily know how many EU nationals work for the organisation that they lead. I also think it is certainly possible that the leadership at the WLMHT may have something to do with WLMHT being rated as “needs improvement” by the Care Quality Commission. But it’s a lot easier to virtue signal, and blame Brexit for your own failings. Too many people are willing to let NHS management get away with poor leadership. This doesn’t help the NHS or its patients, it only covers up real failings that need to be addressed. Care Quality Commission Inspection Rating of West London NHS Mental Health Trust (2017). The CQC found in this inspection that key actions from previous inspections had yet to be addressed, despite WLMHT claiming to have "robust" plans in place for them.